The Theme of the 2015 exhibit is Art in Performance Design: Dreams of Here and Now. In my mind there is no more immediate 'here' and 'now’ and certainly no better room for dreams than: well... in one's mind. 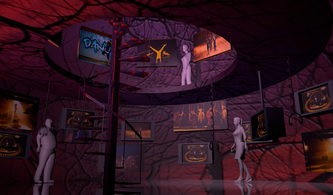 My proposal therefore invites the visitor to step inside the Head of a designer. Literally. The exterior of the exhibit is a large scale sculptural piece in the shape of a Head which has a projectable surface. One ear leads you inside the Head, the other ear leads you out. The Head has a rough, textured quality, incorporating common theatrical materials into its surface, such as ropes, fabric, pullies, gears, shivs, lenses, foam, scissors,staples, costume pieces, old soundboards and lightboards, nails, wheels, screws, etc., all in a monotone color. glue, cut, draw, stick, overlay, imagine, sow, dye, pattern, stitch, draft, model, focus, light, lamp, gel, team work, experience, research, goal... and on and on. The exact words would have to be compiled for this purpose, inviting designers to come up with their suggestions. are coming together, stormy sky showing our thoughts are going through a creative storm... the possibilities are endless and to be discussed. There could be a feature where the visitors can project a photo of themselves onto the 'Head' to see it 20' tall. This video content could be accompanied by a soundscape - if conditions allow. The visitor steps inside the Head through the Head's ear. There is an upper circular level inside the head that can be accessed via spiral staircase. 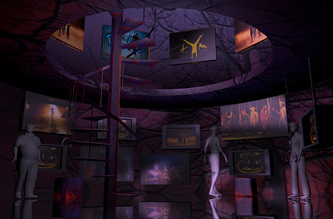 The interior is an intimate and calm space where models, sketches, video screens, costumes, costume sketches, sound stations can be viewed along a circular path on the perimeter of the Head both on the lower and the top level. The spiral staircase, as well as the walls of Head are treated as nerves/veins with controlled lighting to provide the best viewing experience for visitors. The walls are uneven and bumpy and models, screens are sketches could be set within as well as hung to divide the space, tbd. A few places allow visitors to sit to experience sound, music or longer videos in a more comfortable way.